1964 Bullet began life in Britain, lived it in India and now in U.S. The pretty 1964 Royal Enfield Bullet offered for sale on eBay recently sparked a lot of Internet chatter about its authenticity as a product of Britain. One complaint was that people with questions weren't able to pose them to the seller. Had he blocked questions to avoid having to give inconvenient answers? Apparently not. The seller edited the ad to apologize that not all questions were getting through — some did, including one I asked — and he provided his email address for anyone who couldn't reach him through eBay. As for the motorcycle, it has a Colorado title, the seller says — and it's a motorcycle born in Britain, shipped to India and finished and restored there. "I ... appreciate opening the discussion about the origins and authenticity of British vs. Indian Royal Enfields," he wrote, in answer to my question on eBay. "This discussion could go on forever, and as you have seen, when you get down to it, the lines of the who, what, and when become blurry the closer you look. I have spent a lot of time in India motorcycling as well as lot of time looking and learning of the history of these bikes. Most people in India, even the experts (of which I am not) and members of the RE business family have no idea exactly what every change was and when they occurred. "This is obviously not a 100-per-cent British bike. I tried to make it clear in the ad that this bike has a VIN, which I found through the REOC chairman in England, which is on record of being made in and leaving the Redditch factory. I used to own a motorcycle shop here in the states, and am active in vintage motorcycle clubs and scenes. I completely understand the mentality of the vintage purists, and I as well appreciate that level of authenticity. "However, motorcycles are both a passion of mine, and a hobby. I have fun with it, try to not take it too seriously, and more than anything just love the machines; machines of all kinds. But especially Enfields. "That being said, I do want to make it clear that I am most definitely NOT trying to pawn anything off on unsuspecting buyers. On the contrary, I believe I described what this bike is and which parts are NEW. 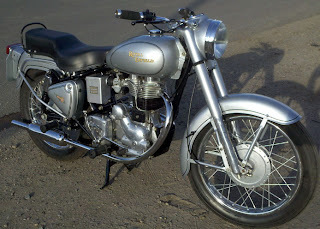 As most people know, only the Royal Enfield factory in Madras, India is still making NEW parts. "I recently edited the ad as I saw that it was not clear that there is a title with the bike — and I do have a Colorado title that comes with this bike. This bike is being sold ONLY in the U.S., and this may be why people in Britain, Australia, etc. are unable to send questions to me over eBay, which may in turn look like I am blocking questions. I have received questions from many Ebay buyers, all stateside I presume, and have gotten back to each and every one." I find purist to be boring at times. If you are in a Concours fine, if you are trying to sell something as being 100% factory correct fine. The wonderful reality is that there are few if any Americans that can leave anything mechanical well enough alone. Each is individualized, does't matter what brand or make.